Jo's Favorite Things: No More Roundup: Weeds Away! No More Roundup: Weeds Away! An environmentally-friendly answer to weeds in patios and walkways? Don't need a gallon? Check below for a conversion to a smaller quantity. And the common salt is called EPSOM salts, not EPSON. Great discussion of the pros and cons of this recipe at the link. The crux of the controversy is whether or not Dove is needed and, if so, whether or not it is also a dangerous product due to the policies and procedures of its creator, Proctor and Gamble. First, use only Dove blue original, nothing anti-bacterial; second, Dove blue, the product that I bought does not contain phosphates. If you are still concerned about Proctor and Gamble's products or issues such as animal testing, etc., (which are real concerns), you might want to try substitutes or see if this product works WITHOUT the Dove at all and report back. Based on the comments, some weedy plants do contain oils, and the soap in the Dove will get rid of that. 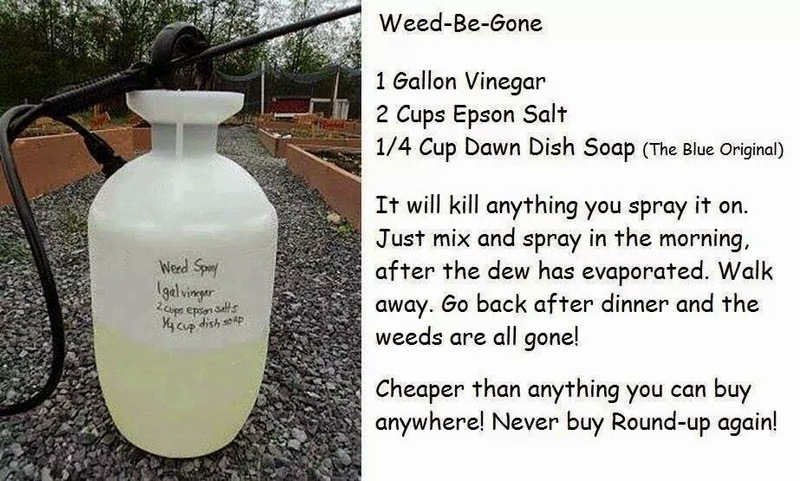 Other people want to make it clear that this recipe will kill all plants with which it comes in conrtact, so don't use it in a flower or vegetable bed. However, I needed much more than the reduced recipe I printed above just to do a few weeds that popped up between my patio blocks. Initially I just used a spray bottle, but ultimately, I just poured the stuff on the weeds. That did the trick for most of the weeds, but it took several days before I noticed any effect. I did a second batch for the stubborn weeds that didn't succumb the first time.